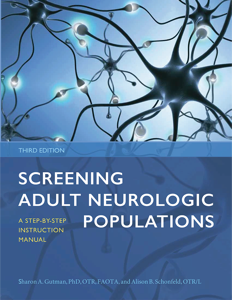 Screening Adult Neurologic Populations, 3rd Ed. This update of the classic text is a functional, easy-to-understand instruction manual describing the most common screening methods for clients with neurological disorders. In this era of managed health care and a focus on quality, the appropriate use of quick and cost-efficient screening methods has become critical in the assessment process. From brain injury to dementia, occupational therapists working with adults with neurological difficulties must be able to efficiently use various screening methods to pinpoint deficits and determine how they affect a client’s daily functioning. Each chapter includes functional implications of impairment, screening procedures, red flags (signs and symptoms), available in-depth assessments, and screening forms. Step-by-step instructions and extensive photographs guide clinicians through the screening process. Designed to allow therapists to easily identify possible impairment, document identified dysfunction, and determine if further in-depth evaluation is warranted, this bestselling text is a valuable reference tool for students to take from the classroom to the clinic.